"Quality lawn maintenance, lawn service, fertilization, weed control, landscaping, aeration, dethatching and snow removal service in Rockwood, Michigan at an affordable price!" A Personal 100% Satisfaction Guarantee! Elegant Greens wants to exceed your expectations with every job we perform. You be the judge. If our work is not superior in quality, we will re-do the job in question for FREE. Our first priority is your complete satisfaction! We want you to be completely satisfied with our service, so happy you will recommend us to your friends, neighbors, and co-workers. To be honest, we want to care for your lawn forever. 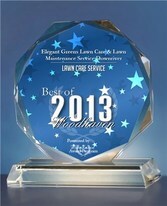 Elegant Greens is a lawn maintenance, landscape maintenance, fertilization, weed control, pet waste removal, landscaping, dethatching, apartment services and snow removal service in Rockwood, MI that services residential, commercial and industrial properties centrally located in Downriver, Michigan. Contact us today, for a free estimate for your Landscaping, Snow Management or Grounds Maintenance needs.